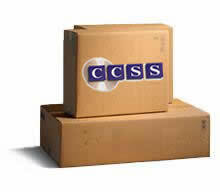 Shipping & Returns : CD/DVD Supplies & Services, CCSS Inc.
How do I return items ordered online? All return requests must occur within 30 days of the invoice date, and be authorized by the returns department. Return authorizations are valid for fifteen days after their issue date. Return authorization numbers must be clearly marked on the outside of each carton. Any box without an RMA number on it will be returned to the sender. Return authorizations must be sent freight prepaid. All orders refused after shipment will be subject to a 15% restocking fee plus inbound & outbound freight charges. There will be no restocking fee assessed for customer orders of non-defective products when a replacement order for equal or greater value is placed. Otherwise, the order is subject to a 15% restocking fee. All non-defective products returned must be in the original condition of the sale; non-saleable products will be returned at the customers expense. Closeout merchandise and special order products cannot be returned for any reason. No returns will be accepted for electrical parts. - All sales are final. All defective merchandise will be accepted according to the vendors guarantee, and newly replaced with the same product that was returned as defective. All defective product must be accompanied by a description of the defect. We reserve the right to implement any revisions of defective merchandise policies from our vendors. Defective products can be tested. If the product is not defective, it will be returned at the customers expense. A charge back will typically show up on your credit card account within 24-48 hours of the charge back being issued. This amount does not always show up on the next credit card statement you receive, depending on your credit card companys billing cycle. If the charge back does not appear on the your statement, call the credit card company to verify the amount has been applied to your account.